Hydrogen production by solar water splitting in photoelectrochemical cells (PEC) has long been considered the holy grail of sustainable energy research. Iron oxide is a promising electrode material. An international team of researchers led by Empa, the Swiss Federal Laboratories for Materials Science and Technology, have now gained in-depth insights into the electronic structure of an iron oxide electrode – while it was in operation. This opens up new possibilities for an affordable hydrogen production from solar energy. Hematite, the mineral form of iron oxide (or trivially, rust), is a promising anode material for photoelectro-chemical cells (PEC) because of its affordability, availability, high stability and good spectral match to the solar spectrum. Although it has the potential of a 15% solar-to-hydrogen energy conversion efficiency, its actual efficiency is lower than that of other metal oxides. This is due to hematite's electronic structure, which only allows for ultrashort electron-hole excited-state lifetimes. Schematic drawing of a photoelectrochemical cell with a 30 nm thin hematite photoanode (orange), properly wired, in contact with electrolyte (blue), illuminated with visible light, separated by a 100 nm thin membrane from the vacuum environment, and analyzed in situ with soft X-rays in the ALS synchrotron. Electrons are well-known (negative) charge carriers, indispensable in our daily lives, but they do not play this role alone. When an electron leaves its assigned place, it leaves behind a hole that can effectively behave like a positive charge carrier, provided that the electron and hole remain separated and do not recombine. In modern semiconductor electronics, holes are important charge carriers, without which devices like batteries, capacitors, fuel cells, solar cells, and PEC could not operate. PEC electrodes typically form electron-hole pairs when struck by sunlight. In PEC photoanodes made of hematite, the generated holes must diffuse to the semiconductor surface, where they can oxidize water and form oxygen. However, the electronic structure of hematite is such that the photo-generated holes tend to recombine with the electrons before reaching the surface. As a result, the resulting photocurrent is limited by the relatively few holes that actually do reach the surface. Recent efforts to optimize the nanostructured morphologies of hematite photoanodes have led to significant improvements in performance, but in spite of these efforts, the overall energy conversion efficiency in hematite remains at only about a third of its potential. An intelligent management of electron and hole transport is, therefore, critical for a better materials performance. In this context, a better understanding of hole states at the hematite surface has been the subject of much interest as well as debate. It has long been suspected that in hematite, two types of holes with different water-splitting power are formed. The existence of different types of holes with disparate reactivity toward water oxidation has broad implications for the ultimate performance of hematite. But it is quite difficult to detect such holes, and studies of this phenomenon are complicated by numerous technical constraints. Moreover, the holes are transitional and quite elusive. In a recent study published in the Journal of Physical Chemistry C, Empa researchers Artur Braun and Debajeet Bora and their colleagues from EPF Lausanne, the University of Basel, China and the US studied the nature of photoelectrically generated holes in a PEC that had been specially designed for gathering data while the cell is in operation. They recorded soft X-ray absorption spectra under simulated sunlight and in the dark and identified two new spectral signatures corresponding to two different hole transitions, an O 2p hole transition into the charge-transfer band and an Fe 3d-type hole transition into the upper Hubbard band. According to Braun, this is the first time that the electronic structure of a PEC photoanode has been analyzed while it was in real water splitting action, i.e. in contact with electrolyte, under anodic bias and illuminated by visible light. "The preparations for this extremely complex experiment took us three years", says Braun. 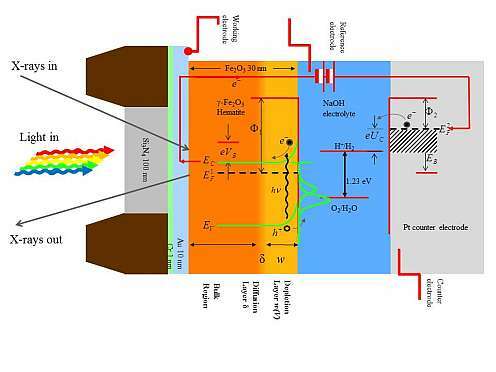 "After all, soft X-ray spectroscopy works only in ultra-high vacuum, and photoelectrochemistry works only in liquids. Combining both was technically a great advancement. Yet, I would say we were very fortunate to discover the two electron holes in an operating PEC." Their groundbreaking experiment demonstrated the formation of two different types of electron holes at the semiconductor-liquid interface under the exact conditions, at which the photocurrent arises. Quantitative analysis of their spectral signatures revealed that both types of holes, contrary to earlier speculation and historical perception, contribute to the resulting photocurrent. "This is a milestone in the understanding of solar water splitting and encouraging news for researchers worldwide who are working to optimize hematite for PEC photoanodes", says Braun. This article appears to be misplaced in the "astronomy" category, perhaps "Earth Sciences" would be more appropriate.